There has been a great deal written criticizing this relatively new concept of everyone getting a trophy. I am not in favor of it for one reason – Failure. Failure is a part of life. I believe all of us meet Failure in our lifetime – both personally and professionally – and the sooner we learn how to deal with it the better. So, instead of teaching young people that we all deserve rewards, thereby not hurting anyone’s feelings, I believe we would help them more by teaching them how to deal with Failure. Your FQ is your Failure Quotient. 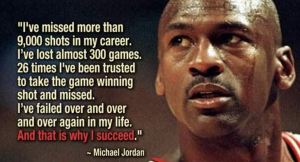 How often can you fail at something and have the resiliency to get back up? Each of these three men had strong FQ’s. Most, if not all achievers, have met or will meet Failure along the way. It is relatively easy to learn from Failure but more difficult to put it behind you. The best analogy I heard to accomplish putting Failure behind you was to have a big box with a huge, strong lock. Put the Failure in the box, lock it tightly, never open it up, and move on. Leaders must learn to deal with Failure. If they have been given trophies all their lives, Failure very well may consume them. However, if they have been taught to develop strong FQ’s they will be in a much better position to lead. Trophies are great but learning to deal with Failure is the better life-long gift.